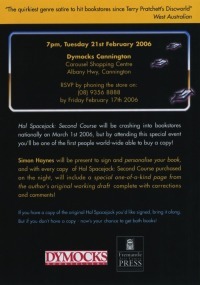 Great fun last night - 50-60 people rocked up to Dymocks Carousel for the Hal Spacejock Second Course launch. I started signing books, and eventually the line had to be halted for a while so we could get a couple of speeches in. Then it was back to signing. Dymocks did a great job, with trays of sandwiches, drinks and nibblies all round. It was great to see people from the first Hal Spacejock launch, as well as readers who'd picked the first book up since September. The store tells me they sold 65 of my books on the night, and the encouraging news is that 1/3 of those were copies of the first title. Fremantle Arts were represented by the hard-working duo of Leone Dyer and Ray Coffey, both of them excited by the sight of so many people and the great reception the books seem to be getting. Back at head office, Nyanda has already sent out review copies and is ensuring the media get to hear about Hal Spacejock. Remember, Hal 2 will be in stores across Australia on the first of March. Even if you couldn't make it to the launch, you'll be able to pick up your own copy of the book very, very soon. No word yet on US or UK publishers, I'm afraid. If you live outside Australia or NZ the only option is to order from somewhere like the Australian Online Bookshop. I'm running a mailing list to keep people informed of any progress in this direction: just visit the mailing list home page to sign up. Finally, the draw for a signed copy of Hal 2 closes in less than a week. Visit this page to enter. It's free, your email won't be used for any other purpose and it's open to all, whichever country you happen to live in. 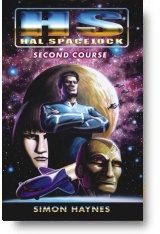 Over the next 7-10 days almost 18,000 Hal Spacejock bookmarks will be hitting bookstores across Australia. I have another 6,000 for distribution to SF conventions and to hand out anywhere and everywhere. One week left until the official Hal Spacejock Second Course launch, and then I'll be drawing the winners of a copy of Hal Spacejock 2. There's still time to enter - just visit http://www.spacejock.com.au/HalNotify.html and get your name in. Last time I drew 10 winners, most of them overseas, so everyone's in with a chance. 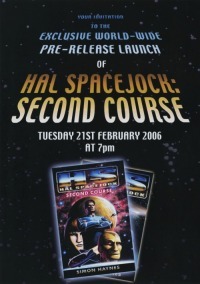 The Hal Spacejock Second Course launch is on in just under two weeks. Click either image to view full size. I've got a couple of great things to share but they're both in progress, almost organised and not quite ready to announce. It's been like that for over a week and the blog's got cobwebs so I thought I'd post what I can. First, a NY agent got in touch with me on Australia Day, offering to shop Hal Spacejock around US publishers. Now, when's the last time you believed an incredible offer delivered via email? Same here, but this one actually checked out. So, ____ from prestigious NY firm _____ with big name clients including ____, _____ and _____ may shortly be approaching huge US publishers like _____ and _____ and _____ and _____ and _____ and _____ and ____ and more with my book. Next, preparations for the launch of Hal Spacejock Second Course are shaping up. Dymocks Carousel will be hosting an event on the ___ of ____ at ___ pm. Not to give away too much, but we're planning a worldwide _____ _____ _____ of the book, along with a _____ ____ containing ______s and a _____ and even a ______ with comments by ______. Signed, too! Wow. I bet you're almost excited as I am. Now for the fun bit. To score bonus points - and not much else - leave a comment with your guesses for the blanks.